Today, I want to discuss about the CCIE R&S Written Exam, what it is, recent changes, and what it takes to pass the exam. If you are planning to sit for it in the near future, you can treat this video as a ReadMe First file for the R&S Exam. 1. Current CCIE Routing and Switching (R&S) Is Known As 400-101 V5.1 Written Exam, Next Major Update Would be 400-101 V6.0! First, let me share some context. 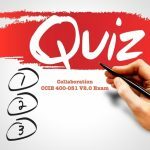 CCIE R&S Exam is known as 400-101 and the current version is 5.1. It was last updated in May of 2017 when Cisco added Evolving Technologies V1.0 section with topics such as cloud computing, network programmability which Cisco calls SDN for some reason, and IOT. 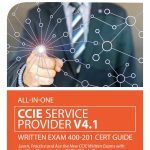 Cisco updated Evolving Technologies to V1.1 with some more focused content around those technologies and applies to all Written Exams NOT just R&S. This happened back in August 30th 2018. Anyhow, what didn’t change is the passing score on the test, which still stands at 804, the lowest of any written exam currently available. Before we move on from this, I want to remind you that Cisco has now committed to making minor exam changes every year and major changes every 3 to 5 years. Cisco defines minor and major changes as content update of 20% or less and 50% or more respectively. How do you know if an update is a minor or major change? Easy! For example, going from V5.0 to V5.1 is a minor change as per Cisco, whereas going from V5.0 to V6.0 would be considered a major change – I bet you can expect that to happen in 20-20. Cisco has committed to publishing exam changes 4 to 6 months prior to them going into effect. 2. The CCIE Routing and Switching (R&S) 400-101 V5.1 Written Exam Consists Of 7 Sections, But L2 and L3 Technologies Carry 50% Weight. Now, let me talk about the breakdown of the R&S V5.1 Exam. It comprises of 7 sections, i.e. network principles, L2 technologies, L3 technologies, infrastructure security, infrastructure services and the mixed bag evolving technologies. These sections carry weights ranging all the way from a meager 10% to a whopping 37%. Speaking about section weights, let me simplify them for you. R or Routing in the exam carries a weight of 37% whereas S or Switching represents about 13%, so R and S combined carry 50% or half of the exam, which makes sense since we’re talking about R&S Exam. VPN technologies, Infrastructure Security and Services combined represent about 30% of the exam, so that’s your 80% when combined with R&S or L3 and L2 technologies. Last but not least, Networking principles and Evolving Technologies combined carry 20% of the weight. 3. You Can’t Pass The CCIE Routing and Switching (R&S) 400-101 V5.1 Written Exam Without Fully Understanding Layer 2 and Layer 3 Technologies. Now, let me share with you some specific guidance on how you can best prepare for the R&S V5.1 Exam. If L2 and L3 exam topics make you nervous, IE topics such as IS-IS metrics, BGP fast convergence, LSA types, propagation control and throttling mechanisms, OSPFv3, MLD, and IGMP versions, then you are NOT ready to take the exam just yet. You can’t screw up these and still pass the exam. Why? As we discussed earlier, half of the questions on the exam are going to be from these two sections. Now, let’s say you are feeling pretty good about L2 and L3 exam topics. Next up is combination of VPN technologies, Infrastructure Security, and Infrastructure Services – what am I talking about? These are about topics such as DMVPN, GETVPN, L3 VPNs, LISP, EIGRP OTP, V6 tunneling techniques, AAA, V6 First Hop security features, 802.1x, and L2 L3 QoS features. Again, if you find clueless about most of those topics, then bad news is that you are not ready to face the exam just yet. On the other hand, if you feel pretty good about them, you are still NOT ready to take the exam. Why! Because, even if you can nail down every question in every section we talked about so far, you can still only get to 80%. Which brings to me to the final two sections, Network Principles and Evolving Technologies. These are, at least for now, are pretty much theoretical as far as CCIE written or lab exams are concerned – may be with the exception of network design, implementation and troubleshooting topics within the network principles section. As we speak, Evolving Technologies is not part of the R&S Lab exam, because Cisco can still sell a whole lot of routing and switching black boxes. In order to comfortably tackle the exam, you gotta be able to feel confident about at least one of those two sections OR mathematically speaking, 90% of the R&S exam topics. Now, what I have not discussed thus far, IE the elephant in the room per se, is HOW to do you prepare for those sections and save yourself a costly Exam retake, otherwise known as 450 US Dollar. Well, you need to tap into as many resources you can. Now, there is a big difference if you are preparing for the first time versus if you are sitting for the Recert or Retake. If this is your first time, I’d strongly suggest going with a structured learning approach which can come from a reputed exam prep provider, IE someone who can provide you with a good balance of learning and passing the test. Beyond that, I’d refer you to spend as much time as you can on Cisco.com. Why? Well, it is their exam and quote and quote correct answers are what they consider correct as documented on Cisco.com. Be sure to read in between the lines, what am I talking about? Say you are reading about OSPF, or EIGRP, then you need to pay attention to all of the caveats involved in Cisco IOS implementation of those protocols and technologies, so read the usage guidelines, limitations, and notes when you are going through a CVD, SRND, TAC docs, Best Practices white papers and what have you. Last bit that I just mentioned, also applies to you if you are sitting for Recert because you don’t pay attention to all that odd ball stuff in your day to day job. 6. Evolving Technologies Section Requires That You Add Online Learning To Your Study Plan. Finally, there is yet another set of topics that most of you don’t get to work on in your day jobs, and that is Evolving Technologies. What makes this section challenging? Well, unlike other sections where your single source of truth is Cisco.com, Evolving Technologies topics are mostly a wild mix of non-Cisco related topics thrown together. IMO, your best source for those topics, besides structured learning i.e. a study guide and what have you, is the INTERNET itself. You should spend some time reading about Evolving Technologies exam topics on websites such as Wikipedia, cloud vendor websites such as AWS, Azure and GCE, and SDxCentral just to name a few to get you started. I hope you found this article helpful and I look forward to hearing from you as to what your learning goals are for the 2019 and what steps are you taking to achieve them.